From a sustainability standpoint, herbs are one of the easiest plants to produce. Many of the herbs we grow are perennials and will produce for many years. Drying herbs is a great way to save money and use for cooking or to enjoy for aromatherapy needs. That said, we haven’t completely put these perennials to their full potential. 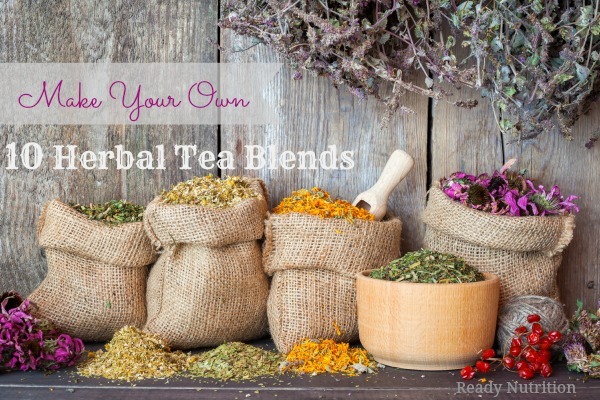 Growing your own tea blends is almost effortless. Many herbs prefer to be on the “dry” side during the growing season, so you can skip a few waterings and they will be ok. In fact, many herbs can be grown in containers on a sunny windowsill or patio. Most herbs will fit into a 1 gallon sized growing pot, but make sure your container has a nice-sized hole so that surplus water can drain away. Herbs do not prefer to have their roots sitting in water-saturated soil. A larger volume of potting mix dries out more slowly, so use the largest pot you can. It’s better to combine two or more plants in a large pot than to use several little pots. Further, fertilize your herbs once a month to ensure your herbs have adequate nutrients. Prune your herbs regularly to harvest the tender leaves. This will also keep plants bushy and discourage them from blooming; often, blooming will change the flavor of the leaves. Harvest the oldest stems individually with scissors rather than pruning the whole plant to keep a steady stream of leaves coming. As well, if you are using fruit trees, when you are pruning them, save the leaves and cut leaves or blossoms to make teas with. Harvest the leaves, blossoms, or the root in some cases such as ginger, dandelion, and echinacea, and thoroughly dry outdoors for 10 days, or use your food dehydrator at a setting of 95 degrees Fahrenheit until completely dry. Most herbs are at their peak just before they bloom. Harvest all your herbs at the end of the season, once a frost is in the forecast. You can dry the herbs whole and store for winter teas or for use as seasonings. Harvest early in the day, after the dew has dried, but while the herbs are still lush in the cool of the morning. Be careful not to tear or crush the herbs until you are ready to use them. You don’t want to waste any of the essential oils. Tea blends can make great gifts for friends and family! You can easily make homemade tea bags out of coffee filters. For an easy tutorial, follow these instructions. My family usually enjoys a cup of tea with raw honey and some fresh lemon, but that is not always the case. Here are some of my favorite tea blends. *check with your healthcare provider to make sure this blend is right for you. To make a nice tasting cup of tea, first warm your teapot with scalding-hot water. Then place your ingredients directly in the pot (or tea ball). For a mild tea, pour 1 cup of boiling water over 2 tsp. of dried leaves or blossoms. Cover the cup with a lid or plate (this helps keep the vital nutrients and beneficial properties of the herbs in the cup and not evaporating into the air). Let steep for at least 10 minutes. Serve the hot drink “as is”, or — if you wish — flavor it with grated fruit rind, lemon juice, or honey. For a greater medicinal effect, make a decoction by gently boiling 1/4 cup of the tea blend in 1 qt. of water until about half of the water has boiled off. Drink 2-3 small cups of the tea daily. After mixing up your favorite blend of herb tea, add them to a glass jar and store in a dark place. I use large mason jars for storing my tea blends. As a general rule, figure on about one to two teaspoons of dried herb(s) per cup of tea. (Double the number of ingredients if you’re using fresh herbs.) And remember that you can get more flavor out of the leaves, blossoms, and berries if they are crushed before using. Consider adding these medicinal plants to your garden and enjoy them year after year. In addition to tea blends, many of these herbs can be used for other natural medicinal needs, such as salves, lotions, tinctures, and decoctions.